Every November and December, tens of thousands of folks suffer serious holiday-related injuries – such as vehicle crashes, falls while decorating, and burns in the kitchen. We’re all at risk. Well-Being turned to the paramedics with American Medical Response (AMR) for advice about making safety a top priority to avoid injuries that could put a damper on our holiday spirit or worse. ladder hazards The main cause of injury from falling off a ladder is misusing the ladder. A few years back, the National Safety Council reported that more than half of those injured had placed the ladder on uneven ground. More than half stood on the top two steps (a huge hazard). About 40 percent fell after dark. More than 20 percent had been drinking alcohol. Warning: men and elders are most likely to suffer ladder-related injuries. christmas trees Shake dead needles out of the tree before putting it up. 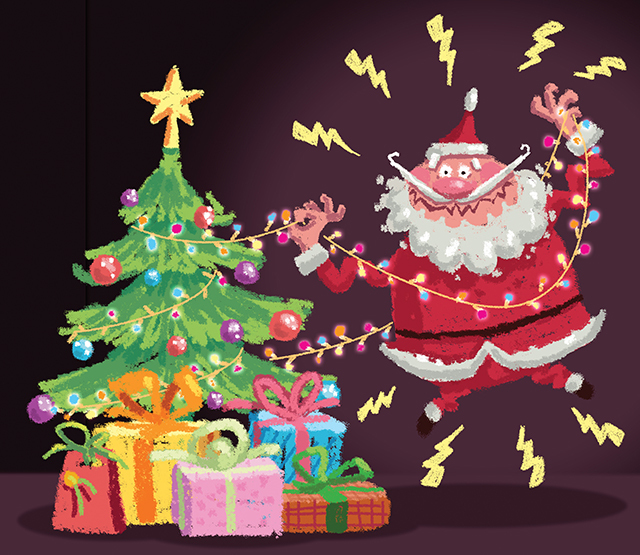 Check the cords on strings of lights and discard any that are in less than tip-top condition. Do not overload cords, power strips or electrical outlets. Never run a cord under a rug. Turn the tree lights off when leaving the house. Watering the tree keeps it fresh and safe longer. decorations Avoid breakable tree ornaments, Santa figurines and other decorations – particularly in homes with children or pets. candles with real flames It’s safest to avoid them all together. choose toys carefully. Visit cpsc.gov (the Consumer Product Safety Commission) for the latest list of toys posing a hazard. Watch for small parts that tykes can put in their mouths. Avoid toys with pull strings more than a few inches long. poisons Lock all medications and cleaning fluids out of kids’ reach. Learn which plants can be dangerous if eaten and don’t bring them into your home. Make sure toddlers can’t get to alcoholic drinks. A very small amount of alcohol can be deadly to a small child. Keep cold foods cold and hot foods hot. road trips. Be sure both the car and the driver(s) are in good condition before heading out. Have the brakes, headlights, taillights, windshield wipers and other safety equipment checked before traveling. Insist that everyone in the vehicle buckles up no matter how short the trip. Give yourself plenty of time to reach your destination. If possible, drive only during the daytime and on major highways (rather than two-lane roads). Keep your headlights on. Switch drivers frequently. Do not continue driving when you’re drowsy. Watch out for big slow recreational vehicles on hills and turns. These safety warnings aren’t meant to be a “downer” when it is time to enjoy the season. Just remember, before you start to deck the halls, put safety first. Preventing tragedy is the best way to ensure we all start 2018 healthy and happy! American Medical Response (AMR) is a leader in the emergency medical services sector. AMR in Central Mississippi serves nearly 20 counties. For more information visit www.amr.net/home/central-ms.